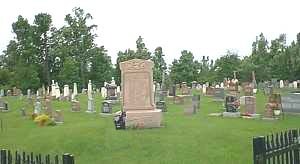 This web page is dedicated to bringing the records of the Riverfield (Quebec) Cemetery to the public for the benefit of family history researchers. The information presented here is the result of an on-going project to create an information database on all persons buried in this cemetery including owner data for administrative purposes. A detailed layout map of the cemetery has also been prepared. Riverfield is a tiny crossroads hamlet in the southwest corner of Quebec, Canada in the Chateauguay Valley. 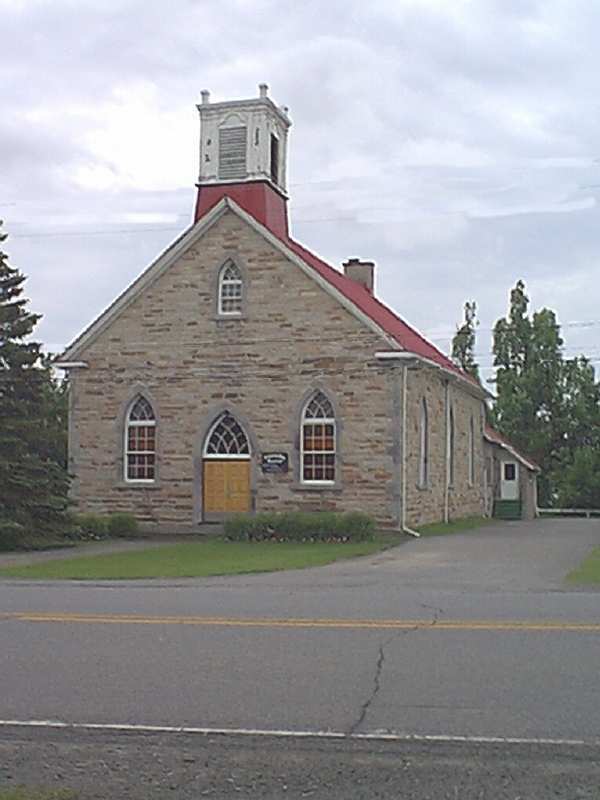 Although it had at one time its own identity with its own post office and was in the County of Chateauguay, it is now legally just part of the Parish of Tres-Saint-Sacrement in the MRC of Haut St-Laurent. It is located on Quebec Route 203 (map) about 4 km south southeast of the village of Howick. It consists of a church, curling rink, a welding/machine shop and a handful of houses. 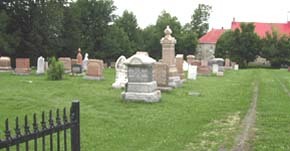 The Riverfield Cemetery dates back to 1830 when the schoolhouse Committee that had built the first school house in the region, cleared and surveyed a graveyard at the back of the school. 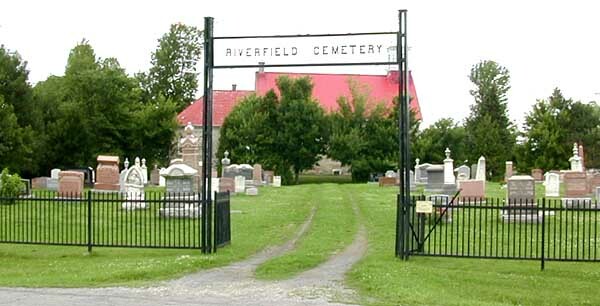 Later it was under the control of the Riverfield Presbyterian Church until the early 1900s when control was transferred to an independent non-profit corporation, the Riverfield Cemetery Inc. This body is managed entirely by a volunteer committee. It was to help insure the continuity of acquired knowledge of the committee members that this database project was started. The information available on the persons buried in the Riverfield Cemetery is somewhat sketchy. 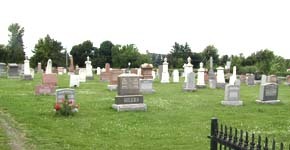 The information is being gathered from cemetery records, church records, monument inscriptions and family history data. We also hope that families will provide missing data on their ancestors. Prior to 1910 the cemetery records did not note the personal details (name, age, death date etc) of the deceased and church records only held the information on those who had funerals in that church and no record of the exact location of burial. A number of the lots do not have a monument installed to list personal details of the deceased buried therein. The result is a less than complete record of burials. The information on this web site consists of two sets of filtered database records. The first primary documents lists all the burials in order of family name. They are split into alphabetic groups to make for easier and quicker downloading. The second set of documents lists the burials of married women in order of their maiden family name. We hope that this helps those searching for relatives who don't know their married names. We have created memo notes for most of the burial plots, based on information from cemetery records, monument inscriptions newspaper accounts and family history records. These notes are available as hot-links from the Monument Family Name in the burial lists. We have not yet incorporated information from church records. That is a future project. If you find any errors or omissions or simply wish to update the notes with family information, please contact the web-master. In addition to the relationship and personal information in the memo notes, we have also created a complete collection of digital photographs of all the monument stones in the cemetery. We have over 600 pictures indexed by lot number and we have both wide view and close-ups of the stones. The old, badly weathered stones have been chalked to enhance the legibility of the inscription. Many granite stones, especially the red and brown varieties, are difficult to photograph due to the lack of contrast on the engraving. These have been "whitewashed" with a harmless chalk mixture to enhance the engraving in the photographs. Due to the sheer volume of data of the photo collection, it is not practical to put it on-line. If you wish to have a copy of the pictures of any particular monument, contact the web-master stating the lot number and the name of the deceased. They are in JPEG format and can be viewed directly on your web browser. A complete set of photos may be available on CDRom in the future. The information collection is progressing albeit slowly. We never anticipated that it would take so long. We are still finding more information. A few years ago we were very lucky to find and copy the original cemetery record book (part of the school committee minutes book dating from 1828) which had been lost. It showed up in the effects of a deceased historian from Montreal and was only hours away from being trashed by the people cleaning out his apartment. It is now in the archives of the local Historical Society and we have copies of it. It shows the list of original lot owners from 1830 as well as later undated ownership lists but only a couple of burial notes. We also located a long buried monument dating back to the 1840s from one of the original ownership families now long gone. This made us wonder if there might be others similarly buried, so we probed the oldest part of the cemetery. It only yielded one more monument and its inscription was very badly eroded showing only the family name. We feel that we now have all the monuments still existing accounted for. We have retaken the photographs of the monuments with a higher resolution camera under conditions that result in much better, more natural photos. The pictures on this web page have also been retaken. Finally we have accessed the church records from most of the local churches in the Valley. They have been indexed and any records that apply to Riverfield have been filed for inclusion in our database. The Quebec Consolidated Death Index 1926-1997 at the Quebec Archives has yielded much of the details such as full death dates, maiden names, etc for persons dying during that period in Quebec that are missing from the monuments. We are currently scanning the local newspaper for death announcements during the past 50 years (a period when some church records have been denied access to us.) Only then will the database be finally updated and a new web page created. 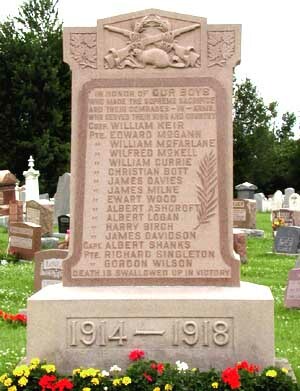 The Riverfield Cemetery also features a war memorial or cenotaph commemorating the sacrifices made by the local lads who gave their lives during the Great War 1914-1918 and World War 2. It sits in the front corner of the cemetery and was accompanied by a WW1 machine gun until the gun was stolen in the spring of 2003. As mentioned above, the Riverfield Cemetery is a non-profit organization. The funds available for upkeep are strictly limited. There are no annual maintenance fees for lot holders. There is a small capital fund built up from previous lot sales and endowments that yields a modest annual return. The main costs of operation are grass cutting, landscaping and monument maintenance. The available funds from capital investment interest, new lot sales and voluntary contributions just barely cover the necessities. 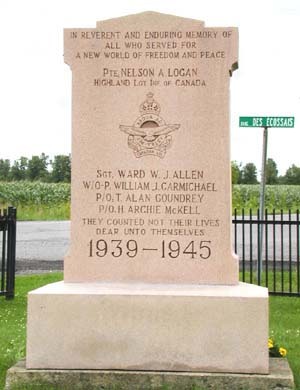 For further information about the Riverfield Cemetery or this web site, contact the Webmaster. ©2002-8 Burton Lang - All rights reserved. The information on these pages is for personal use only and may not be copied or distributed in any form, printed or electronic, without the express permission of the author.